German police have defused a World War Two bomb in central Berlin, after some 10,000 people were evacuated. The evacuation zone included homes, government ministries, hospitals and museums. The disruption lasted from 09:00 to 13:30 (0700-1130 GMT). "Everything went smoothly without complications, and by the book," said police explosives expert Engin Laumer after the 500kg (1,100lb) bomb had been defused. Buildings were cleared in an 800m (2,625ft) radius around the site. Police went door to door to check the area was empty of people before their specialist team began defusing the bomb. Thousands of unexploded bombs from the 1939-45 war are found every year. Berlin was reduced to ruins in 1945 and about 3,000 unexploded bombs are believed to be still lying buried in the city. Flights to and from Tegel airport - about 7km (4.5 miles) away - were not affected by the evacuation. Tegel, which is Berlin's busiest airport, was briefly closed last August after the discovery of a Soviet World War Two bomb. 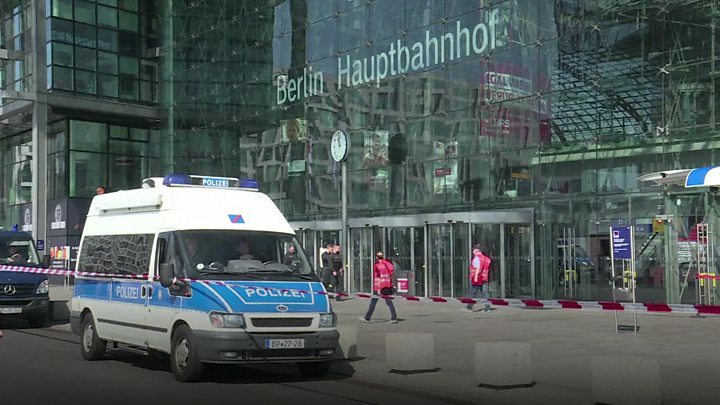 Sitting in the warm sunshine, suitcases beside them, Gabrielle and her sister gazed at the police cordon stretched across the glass façade of Berlin's main railway station. "I hope it doesn't go off!" she laughed. Like many Germans, Gabrielle was rather sanguine about the presence of unexploded ordnance. "They defuse World War Two bombs from time to time in Osnabrueck - my home town - too," she added. The relics of wartime Germany turn up with surprising regularity. Estimates vary but it is thought that at least one in every 10 Allied bombs dropped on this country during World War Two failed to detonate. They are discovered so frequently, often by builders or farmers, that every German state has a specialist team responsible for their disposal. But rarely do they cause such widespread disruption.